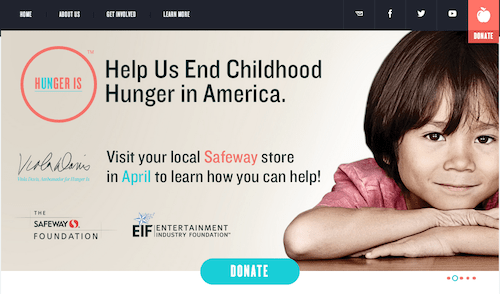 The Safeway Foundation and the Entertainment Industry Foundation (EIF) launched Hunger Is, a joint cause marketing program designed to raise awareness and funds to fight childhood hunger in the United States. The campaign encourages consumers to donate to this initiative online and in Safeway stores during the month of April. A website also asks consumers to share campaign messages via social media and provides a volunteer search tool from Points of Light. Celebrity spokesperson Viola Davis shares her personal childhood hunger story to lend additional attention and authenticity to the effort (PSA below). Safeway is a master of raising funds at point of sale and this program is no exception: within the first 28 days of this campaign, the in-store donation program had raised over $4 million. Interestingly, an advisory committee made up of nonprofits like Share Our Strength, Feeding America and Food Research and Action Center will help the Alliance distribute funds raised via project proposals focused primarily on increasing school breakfasts. While a bit nontraditional, the structure is an attempt to improve collaboration and overall impact on the childhood hunger issue. What do you think of this initiative that raises money first, then decides where it’s going afterwards? What challenges or opportunities does this unique model present?